Today the Dal Libraries is launching a survey, the results of which will shape how the Libraries provide services, technology, collections, and spaces that inspire and support your teaching and research needs. https://secure.insyncsurveys.com.au/surveys/DalhousieUniLCS2019/ to help the Libraries serve you better. The survey is open today through February 17th. 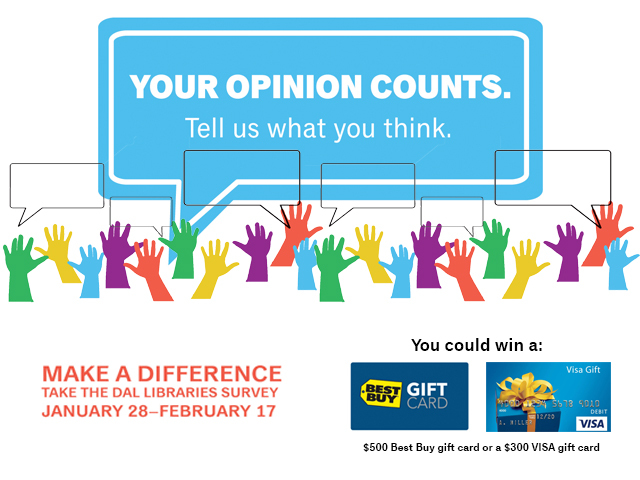 Students and faculty are invited to submit their Dal email address at the end of the survey to be eligible for the prize draw of a $500 Best Buy gift card or a $300 Visa gift card. Your responses will be confidential. If you choose to provide your email address to enter the prize draw, it will be stored separately from your responses and discarded after the prize draw. In the past, the Libraries has responded to survey results with enhancements such as increasing study space with the additions of the Wallace McCain Learning Commons and the Kellogg Library Learning Commons, improving the collection through new acquisitions, and redesigning the Libraries’ website. Thank you for assisting the Libraries to serve you better. For more information about the survey, please visit https://libraries.dal.ca/about/library-assessment/libraries-survey-2019.html.